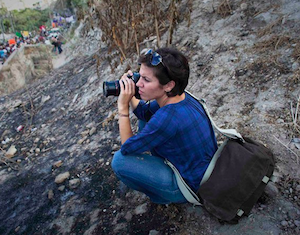 Karoun Demirjian is a multimedia journalist currently based in Moscow, where she is reporting on Russia and the former Soviet Union for The Washington Post and NPR. Until recently, Karoun worked as the sole Washington correspondent for the Las Vegas Sun, covering the White House, the federal courts, and Senate Majority Leader Harry Reid and the Nevada congressional delegation through two election cycles and many national debates about the economy, energy, immigration, housing and defense. Her articles either won or came in as runner up for the Washington Press Club Foundation’s David Lynch memorial award for best regional coverage of Congress in 2012, 2013 and 2014, and her video packages have appeared on the paper’s prize-winning website. Karoun came to the Sun following an overseas stint as a stringer for the Associated Press in Israel, the West Bank and the Gaza Strip in 2010. She previously covered Capitol Hill for Congressional Quarterly and the Chicago Tribune, and also worked at the Tribune as a Metro reporter covering crime, the court beat and community news. She has been the recipient of numerous fellowships, including a Fulbright in Jordan, an Alfa Fellowship in Russia, a Burns Fellowship in Germany, the International Center for Journalists’ Scripps Immigration Fellowship and a Paul Miller Fellowship from the National Press Foundation, and has served on the board of directors of the national Regional Reporters’ Association. She holds a Bachelor’s in History from Harvard University and a Master’s in International Law from the Fletcher School of Law and Diplomacy. Prior to becoming a reporter, Karoun worked for the United Nations, co-authoring reports on peacekeeping operations, disaster relief and emerging democracies. Karoun grew up in the Boston area. She fell into news at the college radio station where she worked as a classical DJ, and a few months later, ended up landing a first internship and producing job at National Public Radio’s All Things Considered. When not scribbling or shooting, Karoun still spends a great deal of time making music as a professional classical soprano and a competent amateur on piano and guitar. She is fluent in Armenian (and English, of course), conversational in Russian, German and Arabic, and studying Spanish.